Chris Merriman will present the March 2014 History Notes lecture at Branigan Cultural Center on Thursday, March 13 at 1pm. Paleoindians were the first people to enter the Western Hemisphere, beginning around 14,000 years ago. Contemporary with this colonization were dramatic climatic and environmental changes that included the extinction of large mammals such as mammoths, mastodons, and giant bison. Using archaeological and ancient climatic records, archaeologists can begin to understand how hunter-gatherers adapt to environmental change. Following a brief overview of the Peopling of the Americas and Paleoindian lifeways, this presentation will discuss the Paleoindian occupation of the Northern Jornada del Muerto and how these First Americans responded to the rapid climate changes during the end of the last Ice Age. Merriman is a doctoral candidate in Anthropology at the University of New Mexico. His dissertation work investigates the earliest occupants of North America through an analysis of their stone tools. He has done extensive fieldwork throughout the West and is currently undertaking research at the Museum of Indian Arts and Culture. Merriman has published on the Weber collection of Paleoindian projectile points and on several sites documenting the hunting practices of the Folsom culture. History Notes, monthly lectures on historical topics, take place on the second Thursday of each month at 1 pm. Please check our webpage for facebook for a full listing of these and other Branigan Cultural Center public programs. The Branigan Cultural Center is located at 501 North Main Street. Gallery hours are Tuesday through Saturday from 9am to 4:30pm. 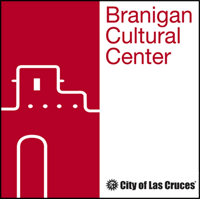 For more information, contact the Branigan Cultural Center at (575) 541-2154 or visit the Center’s website at las-cruces.org/museums.